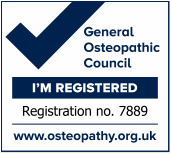 South Downs Osteopathy is a caring, friendly osteopathic practice run by registered Osteopath, Ross Skilton, with clinics in Henfield and Brighton & Hove. We can help with more than just back pain - we treat people of all ages with a variety of muscle, joint, ligament, tendon, nerve and bone-related pains from head to toe. Ross is available for appointments in Henfield on Tuesdays (1pm to 4pm), Thursdays and Fridays (9am to 6pm), and in Brighton on Mondays (10am to 6pm), Tuesdays (10am to 12pm) and Wednesdays (10am to 6pm). Ross can also offer home visits (see fees section for details), as well as special rates for NHS referrals. To book an appointment at South Downs Osteopathy, contact Ross. First time visiting an osteopath? Find out what to expect at your first visit. Osteopaths’ patients include the young, older people, manual workers, office professionals, pregnant women, children and sports people. Patients seek treatment for a wide variety of conditions, including back pain, repetitive strain injury, changes to posture in pregnancy, postural problems caused by driving or work strain, the pain of arthritis and minor sports injuries. Learn more about osteopathy. Can't find what you're looking for? Try our site search tool.